At the John Molson Sports Business conference on Nov. 2, Scott Moore, president of Rogers Sportsnet, asked how many people in attendance use cable TV to watch hockey. About 30 per cent of the crowd reluctantly raised their hands. “That’s not good for [Rogers Sportsnet], because we’re firstly a cable TV company,” Moore said. Next, he asked how many people use Rogers Sportsnet’s streaming service to watch National Hockey League (NHL) games. At least 50 per cent of the crowd raised their hand, and this time with more pride than the people who said they watch cable TV. Lastly, Moore asked how many people have illegally streamed a hockey game in the past. Almost everybody in the room had their hand up. Moore said illegal streaming of NHL games severely affects his business, and “it’s the biggest challenge facing professional sports.” In 2013, Rogers Communications signed a 12-year, $5.2-billion deal to become the exclusive broadcaster of NHL games in Canada from the 2014-15 season through 2025-26. So Moore wants to make sure customers are paying for his company’s service, and not illegally streaming it online. The opening panel at the John Molson Sports Business conference featured Bill Daly, Scott Moore and Stephen Brunt. Photo by Nicholas Di Giovanni. Rogers’s streaming service, Rogers NHL Live, broadcasts almost every NHL game, including playoffs, and is available across multiple devices. An annual membership for Rogers NHL Live is $200, while a monthly membership is $30. However, most streams can be found by simply going to reddit. The Concordian asked reddit users why they would rather stream games than pay Rogers’s subscription fee. The response was overwhelmingly because of blackouts. A broadcast blackout on Rogers NHL Live happens when a fan tries to watch a team in their local market—i.e. a Canadiens fan in Montreal. Moore said blackouts happen to protect local cable TV. But reddit users said they would prefer streaming games than paying for cable. 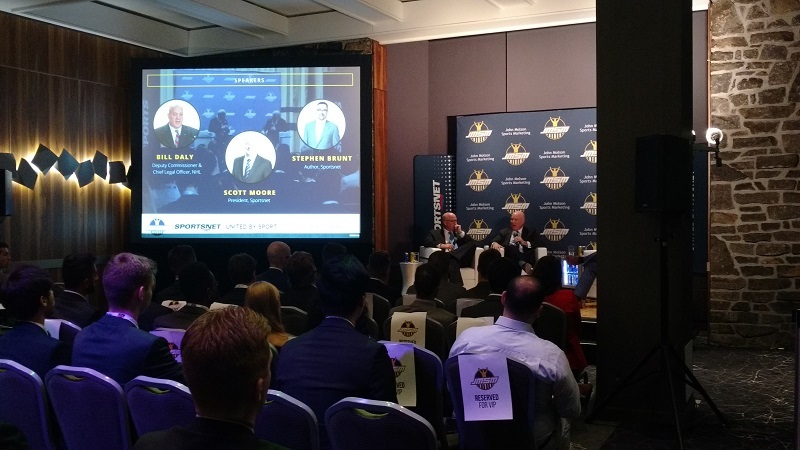 Bill Daly, the NHL deputy commissioner, took part in a panel with Moore and Sportsnet reporter Stephen Brunt at the conference. Daly said the NHL also needs help to shut down illegal streams. Moore added that his company wants to provide a win-win situation for customers, but he said it isn’t a win-win if fans stream games illegally.